Contemporary design sometimes gets a bad wrap for being “cold” and void of personality. But modern and contemporary interior design – when done right – are anything but cold. And statement art is a distinctly modern design tool that can add whimsy, color, personality, and more to your interiors. As some of the beautifully executed examples below will show, statement art can add a modern twist to even the traditionally designed home. Here are five of the most on-trend ways to use large scale designs to make a statement in your own contemporary Atlanta home design. 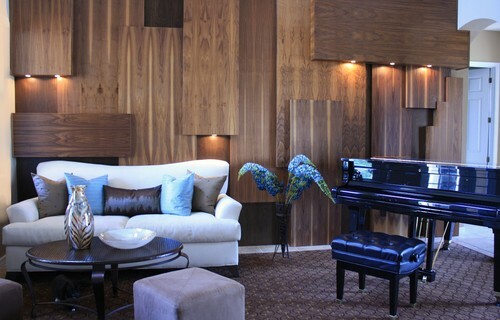 Wall panels a versatile way to add dimension, color, and/or texture to a room. And they come in as many styles as their are home owners. If you’re looking for truly stunning modern wall panels, no one does it better than Alex Turco. From abstract designs, to geode inspired creations, his panels are the definition of show stopping. For a more subtle, but equally beautiful, wall panel something that plays with texture is a great choice. These ridged wood panels overlap and envelope each other in a mesmerizing effect. Layered panels in this Miami living room bring dimension to an otherwise fairly traditional space. Adding lighting features to the raised panels adds both mood lighting and highlights the natural wood grain of the panels themselves. A mural is another way to add statement art to your Atlanta home. And if you are immediately picturing ornate paintings, fear not. Today’s mural options come in fresh, updated styles and a wide range of mediums. FilzFelt is one of the coolest modern vendors for custom wall coverings. They’ve transformed work spaces with whimsical walls. The co-owner has even decked out her own daughter’s with a cheerful geometrical wall mural. A floor to ceiling blow up of a photograph is also a great subject for a mural. Keeping the colors subdued keeps the statement bold, but not overpowering. Even traditional patterns, like florals, take on an delightfully modern feel when done on a large scale and in small area. Textile wall art is not a new concept and it’s stood the test of time for a reason. Taking textiles to grand proportions is also fairly simple as they often come in larger sizes to begin with. Macro Macrame creates custom, hand made rope art for homes and workspaces. The intricate pieces provide a nice alternative to framed art or traditional imagery often used to fill up walls. An African-inspired textile rug can look just as good, if not better, hung on a wall as it does below your feet. St. Frank’s offers exquisite textiles. Add in a frame, and you have instant statement art. Large scale paintings can add a punch of style and/or whimsy in any space. An abstract piece creates a gallery-like feel in this sitting space. Just because it’s big, that doesn’t mean statement art has to be serious. These two rooms used architectural elements in two different ways to highlight an oversized piece of art. The moldings here act as a visual frame, making the painting feel even larger in scale and more customized for the space. By contrast, the painting here overlaps the wainscoting, making the size and height of the artwork that much more obvious and dramatic. We’ll close out this list with large scale sculptural pieces. Sculptures combine many of the best features of the previous entries – they add texture and movement to an otherwise flat space and they come in all shapes and materials. This oversized, geometric sculpture elevates the design of this outdoor patio. A golden, branch-like wall sculpture takes this handsome, but otherwise predictable study to a whole new level. And a sleek metallic wall sculpture mimic the long, lean lines of the rest of the room’s design while adding a pop of dimension to the monochromatic color scheme. Are you interested in bringing your modern Atlanta home to life with statement artwork that reflects your own life and aesthetics? Bold Form Designs offers hourly interior design consultation services perfect for homeowners looking to add the final touches to their home’s interior design. Contact us here to set up your appointment. Interior Design contemporary atlanta interior designer, modern art, modern Atlanta interior design, modern interior design, statement art, wall decor. permalink.